The Omni Group, long known for its elegant Mac OS X software, now offers two iPad-friendly versions of its desktop apps: OmniGraffle—for diagramming, flow charting, and wireframing, and OmniGraphSketcher—for plotting and visualizing data. Both are priced as premium iPad apps; OmniGraffle costs $50, and OmniGraphSketcher costs $15. I spent some time with each app to determine whether they’re worth the price of admission. The first app I tried out was OmniGraffle. Like its desktop counterpart, the app aims to help you express your ideas visually. Translating all of the diagramming depth of the Mac software to the iPad requires rethinking some key interface elements, and Omni did so quite cleverly. When you first launch OmniGraffle on the iPad, you should take time to go through the brief tutorial document preloaded in the app. While many of the touchscreen interface elements in OmniGraffle will quickly (if not immediately) feel intuitive, some of the design decisions are less obvious. The tutorial does a good job of explaining those. The key adaptation you’ll need to make to master OmniGraffle is understanding its different modes. By default, your document will be in a layout and object editing mode. You tap once on an object to select it, and then tap on the info button to bring up a palette that lets you adjust things like fonts, colors, or fills. Tap and hold on an object to move it; tap and hold on one of its handles to resize it. Tap, hold, and release to reveal a contextual menu to copy, paste, delete, group, or lock objects. All those gestures make good sense, and I was able to master them relatively quickly. Taking Shape: You can create new shapes in OmniGraffle by hand or by choosing from built-in stencils across several categories. Creating objects can be slightly more complex. You can use many built-in stencils by dragging and dropping. But to draw your own shapes, you first need to enter the drawing mode, which itself can toggle between a predefined shape mode or a freehand mode. Even once you’ve mastered the technique, it’s still a bit clunky: Once you add an object in draw mode, you have to tap “Done” at the top of the screen before you can re-enter the main editing mode, which never feels entirely obvious. As I worked with more complicated layouts, I started searching for the “send to back” functionality I needed to arrange objects when they overlapped. In OmniGraffle for iPad, that functionality is there, but it’s presented in a unique way: You tap the layers button, and then edit to drag and rearrange the ordering of various objects. It works fine if you have just a few objects, but becomes unmanageable fast. I learned a few shortcuts in OmniGraffle without even trying; I noted that tapping with three fingers immediately pasted whatever I’d copied without needing to trigger the normal paste menu first. But a lot of functionality hides behind several taps. Again, it’s doable, but requires some patience and a learning curve. Occasionally, some edits—like adjusting font size, for example—take far longer than they should even after you’ve navigated to the right menu; for some reason the app takes a long time to process seemingly simple changes. I also encountered some occasional crashes, particularly when editing while zoomed-in. I hope (and expect) that a future update will address these 1.0 bugs. OmniGraffle wisely sports an Undo button, and it supports many, many levels of undo, which is great. One very clever inclusion is the “selection light” mechanism: When you tap and hold on the screen, it lights up beneath your fingertip, and you can then trace a line around numerous objects, just like you’d do with your mouse on the desktop. Overall, creating and editing diagrams and wireframes with OmniGraffle for iPad feels fun and functional. Some tasks—like editing a diagram you already made with the desktop version for quick layout changes—actually feel faster with the iPad. Often, though, creating new documents on the iPad feels a bit slower. Still, the amount of functionality included in OmniGraffle is astounding. OmniGraphSketcher’s focus is on creating beautiful charts and graphs with minimal effort. And it most definitely achieves that goal, although the app suffers from its own interface weaknesses. The app can’t import any numeric data you have; rather, when you create your graphs, you’ll need to enter all the data points manually. 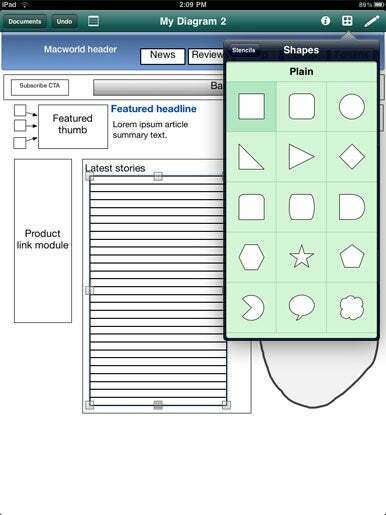 Like OmniGraffle, OmniGraphSketcher offers a document-based tutorial that introduces you to the app’s key features. 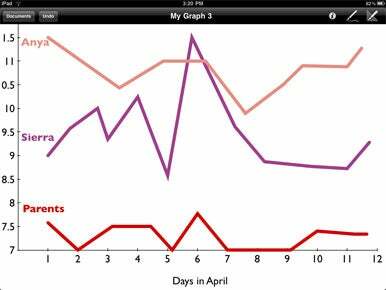 What’s My Line: Creating charts in OmniGraphSketcher is as simple as tracing the lines of data. Once you’ve done that, adjusting colors and thickness is a snap. With a simpler focus than OmniGraffle’s, OmniGraphSketcher is easier to learn. You can literally create a chart in minutes: You double tap the numbers along the axes to set the minimums and maximums, and the app fills in the rest. You can choose to tap individual data points, or trace a line across them. OmniGraphSketcher automatically smoothes out your hand-drawn lines quite pleasantly. Single-tapping on an object lets you tap the info button to make tweaks. You can adjust line thickness, patterns, and colors. You can also control whether individual data points are plotted along the line or not. You can add labels simply by double-tapping anywhere on the screen. In fact, there’s a surprising amount of control for every element of your chart—with one notable exception. OmniGraphSketcher doesn’t offer any direct way to create a legend for your graph; instead, you’ll need to label each line individually, or create your own legend using the in-app tools. Adjusting other elements of your graph is also impressively simple. You can add fills to various sections, change the chart’s type, add or remove data points, and, of course, mix and match all the options to create something incredibly visually compelling—or awful, depending on your skill level. I ran into two glitches that marred my overall experience with the app slightly. On occasion, I found it difficult to enter text-entry mode when creating or editing labels. I’d tap, double tap, tap and hold—it felt like a Skinner Box, since I was never quite sure what I’d done to finally make the keyboard appear. The other annoyance was that the info palette sometimes chose to disappear on its own, even while I was in the middle of using it. The palette would occasionally vanish less than a full second after I’d first tapped to open it. Neither bug is a deal-breaker, though. If you need to create eye-popping charts quickly, and you don’t have too much data to plot, OmniGraphSketcher works wonders, and it’s mostly a delight to use.